Many school administrators believe that ordering a modular building is as simple as making a call. After that, the building is delivered in a couple weeks, right? Though the building process is much faster than traditional construction, modular buildings go through the same site development process. Not only that, but because modules are constructed offsite available production time in factories is an additional factor that can affect the timing of completion. As hectic as springtime can be, it is traditionally the time when most schools are ordering their buildings for the upcoming school year. Production lines at factories fill up quickly so ordering your building early is essential! Waiting until the last minute may cause you to lose the ability of having your building by the time students come back to school in August or September. To begin the process, information is typically gathered to help modular construction companies understand your space needs and vision for the project. Site location is important for many reasons. Zoning regulations, local requirements, and adjacent structures all impact the placement of a building. Occupancy, the size of the building, and additional amenities are also taken into consideration. Feasibility studies help determine if it is truly possible to build on your chosen site. Civil engineers collect soil studies, survey elevations and topography, and even uncover any potential zoning or environmental concerns. After all assessments are complete comes designing the school building. During a modular project, all details (e.g., finishes, cabinetry, lighting, etc.) 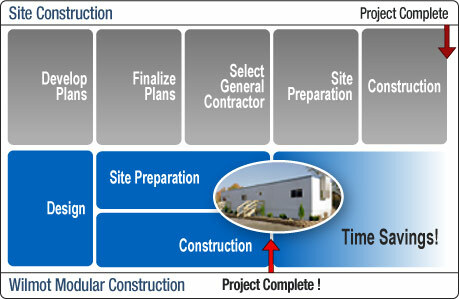 are determined at the beginning of the project since construction happens offsite at a factory. Preliminary drawings, pricing, and an estimated schedule are provided at this point. Next, project drawings are sealed and submitted along with a building permit application to local jurisdiction for approval. These documents are reviewed and when needed, revisions or clarifications are taken care of before approval. Finally comes the construction phase. 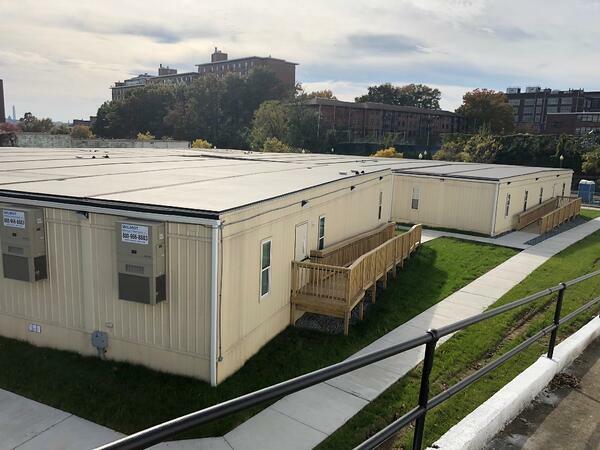 Construction of a modular building take less time than a permanent traditional building which is clearly an advantage when it comes to school projects. In fact, time savings are approximately 40% to 50%! This is mainly because modules are assembled offsite at the same time that the site/location is prepared. Once the building and site are ready, the module is shipped to the site and installed. Additional work such as ADA ramps, sidewalks, and canopies are then assembled before the official walk-through. Any issues are noted and quickly addressed. Finally, once an occupancy permit is issued, furniture and supplies can be moved into the building. When your classroom or office (or even library!) is all set, you’re ready to start operating out of your module! Don’t Procrastinate! Start Planning Now. As you can see, even though modular construction is much speedier than traditional, building a modular classroom or office takes a lot of planning. The new school year will be here before you know it, so don’t hold off any longer! To meet the needs of your students in time, reach out today to discuss your project.